A couple weeks ago, I had one of those moments that as an acupuncturist, I’m usually coaching my patients through: a total food meltdown. 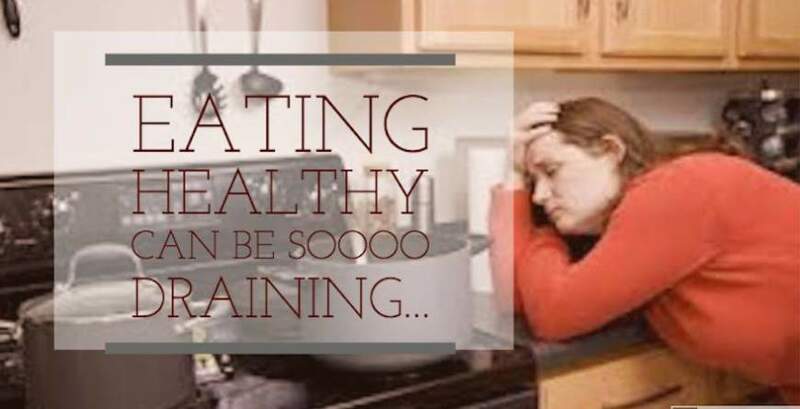 Because I so often hear my patients experience them when they’re trying to completely overhaul their entire way of eating, once I was through it (and thinking clearly) I knew what this next blog would be about — sharing my experience in hopes that it might be an inspiration to others when they’re in the middle of their own version of a food meltdown. Because if we think we’re just doing it wrong when we stumble upon challenges (EXPECT them to come…don’t be surprised that they do. Be prepared!) it’s easy for those who haven’t gained a strong chest of “tools” to think “this must not be for me…I’m just not cut out for this, it’s too hard”. And then they quit entirely. Hearing that even people who’ve been eating healthy for years come upon challenges as well, and somehow work through them to more or less stay on track, can really help break through those hard times and re-inspire some to get back on board. It was Monday morning, the beginning of another very full week. I had no food in the house. My entire “food plan” hinges upon me taking the time at some point over the weekend to shop and spend about 3-4 hours in the kitchen cooking. If I don’t take that time over the weekend, that next entire week basically goes down the drain. While this may still be better than how most people eat, and/or still be organic or gluten free, after a handful of days of this, I start feeling pretty crummy. On top of this, the past two weekends building up to this Monday I’d either been out of town or working on huge projects to the extent that I never made it into the kitchen. That meant that just the prior week, I’d already been through one of those sub-par food weeks, and was therefore already also feeling the effects of improper nutrition. So it was now breakfast time on week two of no cooking or shopping, and I looked in the fridge to discover that I didn’t even have eggs with which to make a quick, decent breakfast. No quick proteins for a quick snack either. I was hungry, rushed, and preparing for a busy week at work that would “allow no time” for cooking. I looked ahead in my mind over the next days and all I could foretell was feeling worse and worse as I slogged through another week of poor eating. All the work I put into living healthy. All the effort I make in the midst of the crazy processed food world we live in, to still take care of myself. The fact that I’d also like to feel like I had a life outside of my food choices that should allow for some weekends “off” of cooking. I was sad and teary. I literally went to the clinic that day and saw patients with puffy, tear strained eyes. Because suddenly, in the midst of this food meltdown, the enormity of how difficult it can be in the midst of busy schedules and a society that only offers you crap to eat unless you go immensely out of your way at every turn, hit me like a freight train. The usual activities I love, of shopping at the farmers market, poring over my cookbooks planning out my week’s menus, researching resources for local grass fed meat a dairy products, and all the rest of it, suddenly just felt like a huge thorn in my side. To be honest, I was just downright pissed. I was pissed at the entire industrial food complex that seemed to be “controlling” how hard eating healthy can be (do I hear Victim?). I was pissed that I don’t have the kind of body that can just eat whatever I want and still feel great. I was pissed that I wasn’t one of those people who can just tune out of their bodies completely and feel totally “fine” sitting in front of the TV munching on Doritos and delivered pizza, or working themselves into a frenzy for years on end, never taking the time to prioritize food. But most of all, I felt like a failure. After all, I was the person who was supposed to be the inspiration for my patients! I’m their health coach, I’m supposed to have it all together and have the answers so times like this don’t happen. I’m the model for clean, healthy living! I’m constantly telling my patients it’s not that hard, they just need to find a way to make it fun! It’s not that hard, just change your priorities, darn it! It’s not that hard, this is how I do it, maybe these tools can work for you too! But food hits us at one of the deepest, even emotional parts, of our being. Woven into the nutrition in the food is our entire history, our memories, and for some, our “drug” for when emotions get intense. It’s how we celebrate, it’s how we nourish. In some cases, it’s even deeply tied into how we feel about ourselves as a person, our identity. People who have struggled with weight their whole lives associate food with shame and fat, not nourishment. Someone like me, an absolute foodie who somehow figured out half my life ago that healthy living and natural, unadulterated food were my number one passions, can feel like everything I believe in is tumbling down around me. All because I didn’t have anything to eat for breakfast when I opened the fridge that morning. That was a little extreme of a reaction, don’t you think? Yet so many of you whom I treat, especially those who are trying to give up grains, are having similar reactions. Serious, full-blown, show stopping, emotional meltdowns. You’re hungry, you don’t know what to eat, and suddenly your whole food plan is blown, and you say “Screw it! this is too darn hard, it’s not worth it”. I know. I understand. So what did I do? Well, I stopped by Whole Foods on my way to work and once again, with red puffy eyes, got a roasted whole chicken and carrot sticks, and some completely underwhelming breakfast food from the hot deli section. I stumbled through my day feeling “off” and not myself. And then, since as the saying goes, I was sick and tired enough of feeling sick and tired, I sucked it up and went against my usual weekday routine and the first chance I got, I made a list and went to Whole Foods for real this time, and did the shop that I usually do on the weekend. I wasn’t in the mood, and I felt like I “should” have been working if I’d been a more responsible person and “had my act together” in the first place. But I did it, so that come the next day’s lunch break, I could go home and cook, however inconvenient. And I ate my first home-cooked, nutritious, absolutely satisfying and satiating meal that I’d had in two weeks. Ahhhh, relief. The meltdown was over, inspiration renewed, and my fridge was stocked once again. And, I started sharing this story with some of you during your appointments as you came for your treatments over the next few days. I knew this was important to share. Why? And so, I say to myself and all of you who sometimes struggle with fitting healthy eating into busy lives: ”Ahhhhh, ‘messed up’ again…wonderful! Another opportunity to open up the cookbooks, try new amazing recipes, and get reinspired and cook”. What I have to remind myself of over and over again, is that we don’t make a choice to eat healthy once, and then we’re done. We do it again and again every day we wake up. Every time we “mess up”. We just get back and remake our choice again and again and again. Despite busyness, despite friends who don’t eat the way we do and so we feel like The-Big-Pain-In-The-You-Know-What at group gatherings…despite our food meltdowns. Sometimes we soar, sometimes we crawl out of the trash can and start over. This was a “crawl out of the trashcan” week for me, for sure. Paleo Shepherd’s Pie, made with cauliflower and sweet potato mash instead of potatoes, combining both the best of Paleo and Chinese medicine nutrition principles for this time of year. So, I’ll call the last couple weeks a triumph in the kitchen. A food success. We win some in this quest to take care of ourselves, we lose some. But because even for those of us who don’t usually have food issues, there are going to be those days when we feel like losers in the realm of our eating, I think the point that this meltdown taught me again, is that we just keep shooting for winning, even when we’re recovering from another loss.